Lewis Booth: Ford CEO Alan Mulally's de facto second in command. DETROIT -- Lewis Booth, Ford Motor Co.'s chief financial officer, plans to retire in the first half of this year, clearing the way for CEO Alan Mulally to step up efforts to groom the next CEO, according to two people familiar with the plan. Mulally, 66, will probably retire around the end of 2013 and Booth's departure gives him the opportunity to name a new No. 2 executive who could be trained as the next CEO, most likely Mark Fields, said one of the people, who asked not to be identified disclosing private plans. Fields, 50, runs operations in North America and South America. Booth, 63, has been Mulally's de facto second in command. 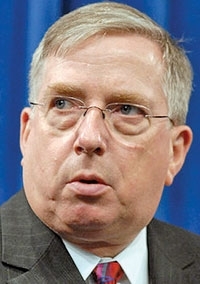 Asked Monday at the Detroit auto show if he planned to retire in the first half of this year, Booth declined to comment. When Mulally was asked later if he felt his job was done turning Ford around, the CEO responded: "I'm just getting started." "This sets up Mark Fields for a higher position he can step up to," Michelle Krebs, an analyst with auto researcher Edmunds.com, said Monday. "This will move more pieces into place, but I still don't think we'll see the whole picture for a while." Booth became Ford's finance chief in November 2008, as the Dearborn-based automaker was completing a year in which it lost a record $14.8 billion and its share price fell as low as $1.26. The executive engineered Ford's largest ever debt restructuring in 2009, led the sale of its Volvo luxury line to China's Zhejiang Geely Holding Group Co. in 2010 and spearheaded restoration of Ford's dividend after a five-year-suspension. The automaker's shares closed yesterday at $11.80, it made $6.6 billion in the first nine months of last year and it's within one level of an investment-grade credit rating. Booth, the son of a Liverpool, England, car dealer, also had a significant say in Ford's global operations, said the person. Prior to becoming CFO, Booth spent 12 years running Ford's regional carmaking operations, first in South Africa, then Asia and finally in Europe. He engineered a turnaround at Mazda Motor Corp. in Japan, at the time controlled by Ford, overhauled the company's European car lineup and likes to drive a Transit Connect delivery van with racing stripes. "He literally knows how the entire Ford world works more than any executive we have in the company," Chairman Bill Ford said in a 2009 interview. Booth is leaving now in part because Ford's board didn't want to lose him and Mulally at the same time, said the person. That would have left too large a leadership void at the top of the company. By staggering their departures, Mulally will have time to groom someone, probably Fields, to first take on some of Booth's former duties and eventually grow into the CEO job, the person said. Fields preceded Booth in running Mazda from 2000 to 2002. "Lewis Booth did an outstanding job," said Krebs, who is based in West Bloomfield, Michigan. "He cleaned up the mistakes of the past and kept people on track and accountable. You can't argue with the numbers or the course he helped put Ford on." In May of last year, Booth joined the board of British jet engine maker Rolls-Royce Holdings Plc. Because of his Ford responsibilities, Booth is not always able to attend the Rolls Royce board meetings, said the person. Mulally also has the title of president. The executive hasn't named a chief operating officer since arriving at Ford in September 2006 from Boeing Co., where he headed that company's commercial aircraft operations. Mulally hasn't said when he plans to retire and he denied a report in the Wall Street Journal last month that the board is looking outside the company for his replacement. "Alan Mulally has made clear that he remains absolutely focused on continuing to make progress on our One Ford plan and has no plans to leave anytime soon," said Karen Hampton, a Ford spokeswoman. Had Booth been younger, he would have been a leading candidate for the CEO job, the person said. Booth has said he is at peace with not getting the post. "Everything I have is because of Ford Motor Company, and we got preciously close two years ago to losing it all," Booth said in an interview at the 2010 Paris auto show. "If between us all we can get this place straight, then we can retire in peace."